What kid doesn't enjoy having fun and playing games! Building math skills through addition and subtraction games should be a no-brainer. Lots of them here, so be sure to look around the rest of the site after checking out this page. 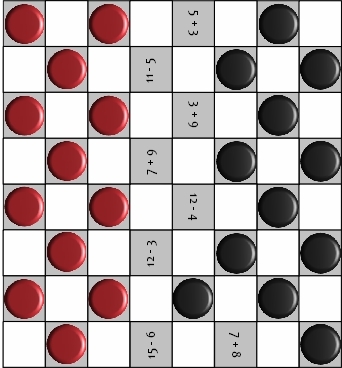 Classic board game of checkers with a math twist! Most kids already know how to play the game of checkers, so this game is a natural fit. They'll catch on really quick. Classic Board Games to Help Build Math Skills! The best part about board games is kids love playing them! What You Need: Print the Checker math game board, Two different color sets of Checkers, Addition and Subtraction facts Table or calculator to check each others answers. Place the checkerboard in the middle of the two players on the table. Players decide which color pieces they want. 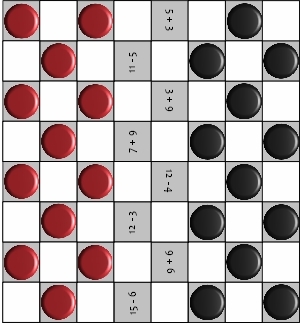 Each player sets their pieces on the gray squares on the first three rows in front of them on the checkerboard. See picture below. The first player starts by moving one of his or her pieces forward diagonally one space to an empty gray square. The player must answer the math fact of the empty square correctly in order to to the new square. Otherwise they stay at their current square. The second player proceeds in the same way and play alternates throughout the game. A player captures another player's piece by jumping over the opponent's piece to an empty square just beyond the piece they're trying to capture. 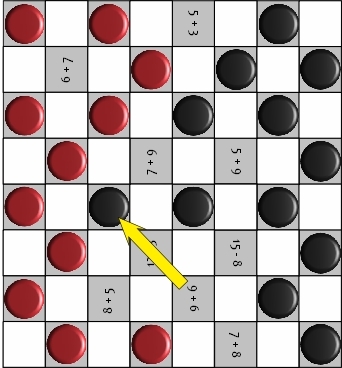 The player must answer the math fact correctly in order to jump over their opponent's piece to the empty square. The opponent should check their answer with calculator to see whether it's right or wrong. "Nine Plus Six Equals Fifteen". Since they stated the addition fact correctly, they move their piece to the empty space. 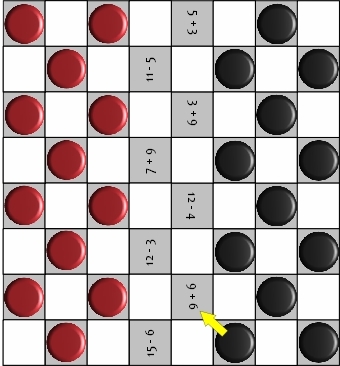 In the picture below player mover their piece to the 9 + 6 square. The second player proceeds the same way. Player's make a capture by leaping over one of their opponent's pieces in a straight diagonal line on the other side. In order to do so, the the square they're jumping to must be empty, and they must answer the math fact for the empty square correctly. Otherwise they stay where they are. 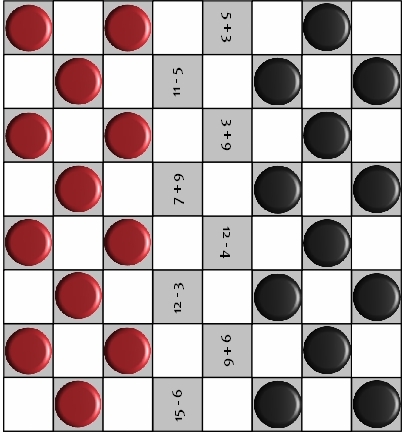 The picture below shows the player in black attempting to capture the red player's piece. The yellow arrow points to the empty square the player is trying to get to while leaping over the opponent's piece. 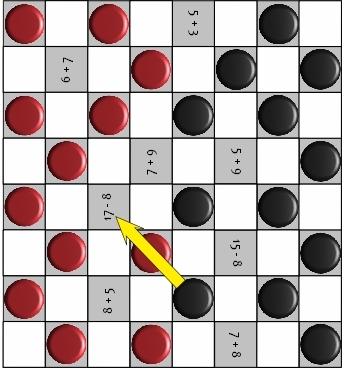 "Seventeen minus Eight equals Nine"
Since this is correct, the player leaps to the new square and removes the red piece from the board as shown in the picture below. Addition Flashcards: Learning addition the fun hands-on way! Printable flashcards are a great tool for teaching subtraction. Here's a regrouping activity that helps students visualize addition. Print these fun subtraction triangles for building subtracting skills!